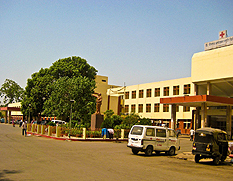 Until 1995 the District hospital (D. K. Hospital) was attached to the college as the teaching hospital. In the year 1995, 700 bedded Dr. B.R. Ambedkar Memorial Hospital came into existence in the college campus and was officially affiliated to the college as the teaching hospital. Dr Bhimrao Ambedkar Memorial Hospital is the only tertiary level medical and health institution in this area which provides speciality health services to approximate 2.5 crore population of state of Chhattisgarh and also the neighbouring States. The OPD service runs daily from 8.30 am to 1.30 pm, except Sunday, with 24 hours emergency services. Average daily OPD attendance is more than 900 patients with more than 100 major and minor surgical procedures done daily across the 11 fully equipped operation theatres.